I’m linking to my Herald on Sunday column for those with a premium content subscription. 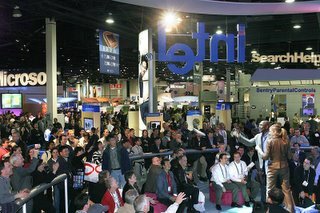 It’s about the massive Consumer Electronics Show held earlier this month in Las Vegas. I’m pretty jaded with tech shows but I wish I’d got to that one. By all accounts it was pretty impressive. Oh yeah, the Internet. 2005 certainly made me look at it in a different way because of the new free services it offered up (see The Free Face of the Web below). Google will continue to be the company to watch though there may be a little cooling off in demand for its shares as competitors catch up with the internet juggernaut. The Google Print project may be stymied this year by legal action, but the alliance with Sun, Google Video and the company’s expansive partnership plans will be interesting to watch. I’m less enthusiastic about the Windows Live concept, it seems like a foregone conclusion and doesn’t seem to add much that isn’t already out there and easy to access. But I am looking forward to Vista. By the way, I’ve been watching some high definition video clips fed from Windows Media player 10 through to a beautiful Loewe LCD TV screen I’m testing at the moment and the results are pretty impressive. Who needs a media centre PC when you can plug your laptop in and get a ready-made entertainment hub?